For my first post of JSW (Just Science week, Feb 5-9), i'm going to introduce my field of study, sedimentary geology, with an illustration. Much of the rest of this week, I will be discussing more than you've ever wanted to know about the sedimentation along continental margins. Actually, I have no idea what i'll be posting about...that's my guess...you'll have to stay tuned. 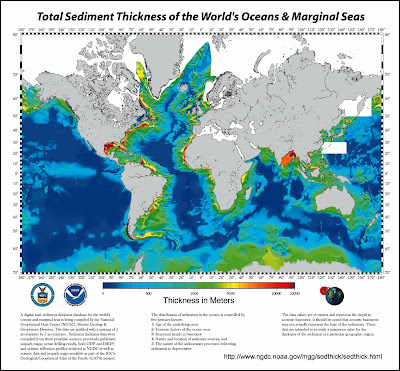 The above figure, which can be found here, shows the thickness of sediment in the world's oceans and marginal seas. I love this map...it is really great to get a global view like this. Like many others investigating patterns of nature, it is necessary to look at all scales. This post starts out big....the whole globe. Subsquent posts will zoom in spatially as well as pull back temporally and get a sense of past conditions. One of the first things to focus on is the continents of North and South America. 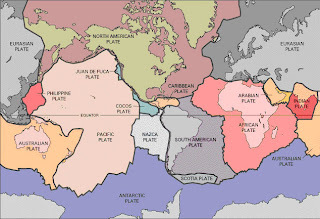 At this scale the configuration (and history) of the tectonic plates clearly governs the patterns (see map of plate boundaries below). Note the asymmetry of sediment thickness....the eastern margins of the land masses have thick accumuations (the hotter colors) of sediment whereas the western margins do not. The active western margins consist of a subduction margin in South America, transform margin in southern North America, and subduction margin in northern North America at a very large scale. This activity, although it creates a lot of high relief nearshore producing sediment, is not the bes t place to preserve sediment over long time scales. The accumulations along the eastern, or "passive" margins, are so thick because they've been piling up for 10s of millions of years. These two strikingly different tectonic settings should be kept in mind. Another notable pattern on the map of sediment thickness is the Bengal submarine fan. This fan, which sits in the Bay of Bengal between India and southeast Asia is the single largest accumulation of sediment on the planet (extending for nearly 30 degrees of latitude from the margin!). Big deal. So, you may be asking so what...why should we study these accumulations of sediment? I hope to show you with a series of posts why I think it's interesting from a scientific standpoint to figure these things out. From the small-scale processes of transporting/depositing sediment to the spectacular geomorphology present on the sea floor to the implications to studying Earth history. And, by now, i'm sure most of you may have also noticed the spatial coincidence of some of the thicker accumulations with petroleum provinces. This is no coincidence for sure....where you pile up a bunch of sediment over a long period of time you get the perfect host for our world's (for better or for worse) lifeblood. I'm not going to go too much into this particular application of sedimentary geology...at least not this week. My aim is higher....I want to learn as much as I can from these sediments/rocks. I'm a data junkie...I'll admit it. I want to observe and characterize information about the Earth....i'll take it where I can get it. 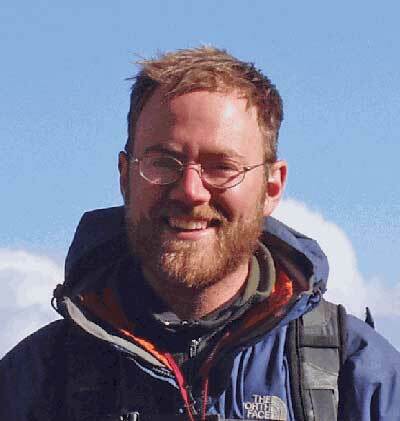 I've been working on a post about 'peak oil' from a sedimentary geologist's perspective....but not this week. This week, i'll be using this information to tell you something (hopefully) interesting about our planet. So why does the western Atlantic have thicker sediment than the Eastern Atlantic? That's a good question...the first thing about that map that i've always noticed is that the sedimentary succession off the Niger delta (in the "armpit" of Africa) is way under-represented on that map. It should be at least 12 km thick. So, one reason could be data bias...there is much more known about east coast of North and South America. But, the area of west Africa north of the Niger also doesn't have any giant rivers emptying into the Atlantic. Same with Europe to some extent. Those are my thoughts off the top of my head.